The Author, Justin Coutts (that’s me), lives on Manitoulin Island off the north shore of Lake Huron, in the small town of Gore Bay. It is a beautiful and quiet place where deer walk down the sidewalks and everyone knows everyone else. I moved to Manitoulin Island when I was twenty years old, before hand I had lived in primarily in south western Ontario. I was born into a dysfunctional family. We were Quakers in a small, rural community in the village of Sparta in rural Ontario. My mother introduced me to the world of Ojibwe ceremony at a very young age and my earliest memories are of smudging with her in the window cubby in the upstairs of our old Victorian farm house. This notion that all who humbly seek the Truth and act justly within the world are practicing true religion is what allowed my mother to raise me in a solidly rooted and traditional Quaker community while also taking me to Ojibwe ceremonies and teaching me Wicca. I left home at the age of fifteen under less than ideal circumstances and spent approximately five years living on the streets and being in and out of various institutions. At the age of nineteen I had a profound religious experience while high on PCP in a squat in Montreal. While the experience was distinctly Christian it took me, after a great deal of resistance on my part, to a place known as Thunder Mountain, deep in the wilderness of Northern Ontario. The spirits of that place are known as Thunder Birds and they became the center of my early spiritual life. They grabbed me by the scruff of the neck and dragged me kicking and screaming from the life of a nomadic anarchist into a life of spiritual devotion. I met an Ojibwe elder at Thunder Mountain who taught me how to work, how to pray, how to serve the people, and how to speak to the trees, rocks, stars, and lakes. I studied as his apprentice for about 7 years and learned many ineffable and immensely valuable things. During that time, and for a few years afterwards, I had the opportunity to learn from a variety of other elders and medicine people and my spiritual sense is still heavily shaped by those teachings. Once, during a sweat lodge, I was praying to my ancestors – which is a normal practice I had never really spent much time thinking about. When much to my wondering eyes did appear a group of ancient Celts who spoke to me in a way only spirits can, by skipping the words and going straight to the meaning. They reminded me that they were real people and that I should get to know them. 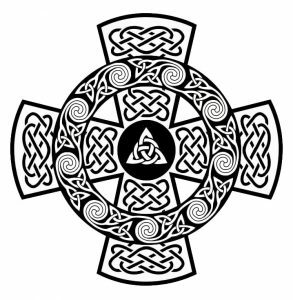 Over the years which followed I attempted to learn about Celtic pagan religion but found myself dissatisfied with the information available and was unable to find a living tradition which met my spiritual needs. Eventually I found my way into a liberal mainline protestant church and with the guidance of my minister found my way into the pulpit. For the last few years I have endeavoured to answer the call of my ancestors while engaging in my Christian faith. I began a masters degree in divinity at a well known Canadian seminary and completed about one third of a three year degree. During that time I worked as the minister of a small rural church in Northern Ontario for almost two years. While the social values of that church are something I hold dearly to I have found the spirituality to be dull. In my own search I found the teachings of modern day contemplatives and mystics like Richard Rohr, John O’Donohue, Thomas Merton, Cynthia Bourgeault, and Thomas Keating and through their works I came to learn about the contemplative Christian tradition. This journey lead me to a book known only as The Cloud of Unknowing, which forms a large basis of what you will find on this site. I feel a certain affinity for my Celtic ancestors who incorporated their traditional pagan ways with their new-found Christianity, and so my work reflects that historical process ironically playing out in my life today. My upbringing and the majority of my spiritual training are pagan, and I know that Western Christianity has lost something the indigenous traditions still maintain. I believe my call from the Lord is to bridge these two worlds and to walk faithfully with Christ while carrying what I have learned from the Thunder Birds, the elders, and the very stones of the Earth.